Christmas is almost here, so today we’re featuring a hand-picked collection of “stocking stuffers” for precision shooters. So as not to bust your holiday budget, all of our selections are priced under $10.00. These items are handy tools that you’ll use over and over again at the range and/or at your loading bench (so you’re allowed to buy them for yourself, even after Christmas). Our AccurateShooter staffers use most of these items, including the Loading Blocks, Ballistol, Mirage Shades, Crocogators, and Barrel Bags. Sinclair Barrel Bag. If you run a switch-barrel rig, or take spare barrels to a big match, this simple but effective barrel bag will protect your valuable steel. The bag is moisture-resistant vinyl on the outside with a soft, quilted interior to protect the barrel’s finish and delicate crown. There are two sizes: one for barrels up to 26 inches, the other for barrels up to 31 inches. Both sizes are priced at $9.95 per bag. That’s cheap insurance for those priceless barrels. 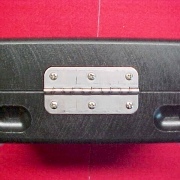 Sinclair ‘Poly’ Loading Block. We’ve tried wood and injection-molded loading trays, and we prefer Sinclair’s white polyethylene loading blocks. 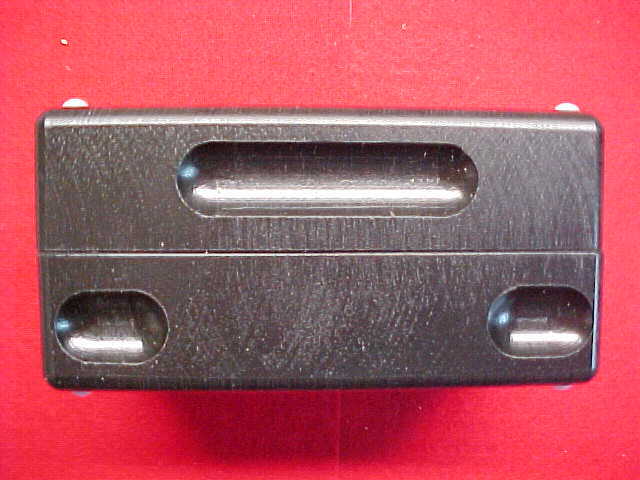 They featured chamfered holes properly sized for the particular case you reload. The blocks are heavy enough to be stable on the bench, and the “dishwasher-friendly” material is easy to clean. The standard Poly Loading Block holds 50 cases, while the Competition Loading Block holds 25 cases with a tray for empties. For a bit more money, there’s also a Heavy-Duty 50-case model with an extra-thick 1″ base. Share the post "Shooters’ Stocking Stuffers — Eight Budget Gifts"
Up in Wisconsin, a gentleman named Joe Maisto crafts some exceptionally nice competition cartridge boxes. 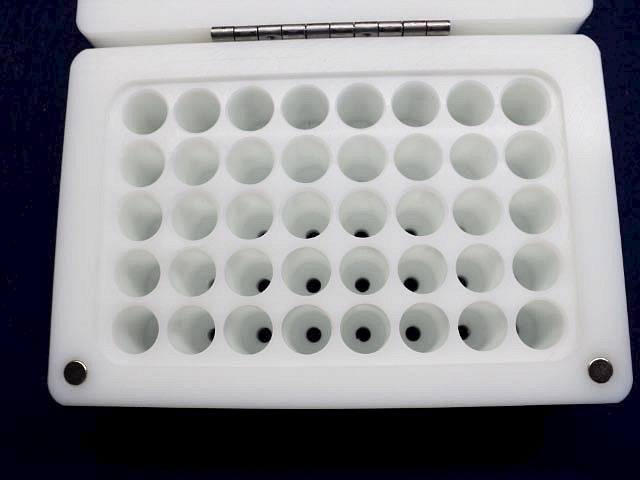 Each box is hand-machined (no molds, no CNC), with the holes precisely fitted to the cartridge you shoot. Joe has been building his boxes since 1996, first from wood, and now from more durable (and easier-to-clean) polymers. 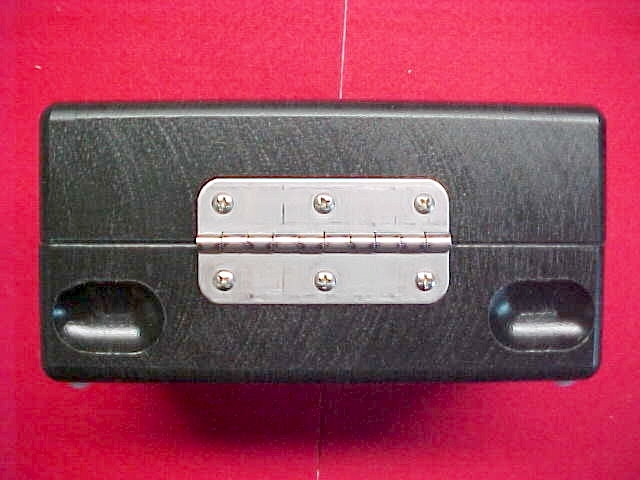 Joe started with a hinge-top 25-round box (with magnetic latch) for short-range benchresters. He still makes that box, but now he also offers 40-round boxes, high-top boxes (for bigger, taller cartridges), open top cartridge blocks, and combo blocks with holes for cases and a built-in tray. Our buddies in the short-range benchrest game say the Maisto boxes are perfect for carrying rounds from the loading bench to the firing line. GO TO Joseph Maisto website. These units were designed in 1996. The originals were machined of Walnut, Cherry, or Birch. They were lovely, laborious, and expensive. To make the price more affordable, the wood units have since been retired in favor of high density polyethylene (HDPE). 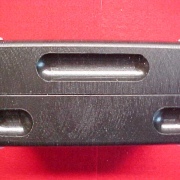 The front holes are separated for “record rounds”. 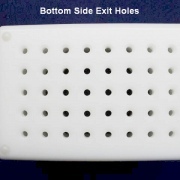 Holes are bored with a minimum of clearance, and up to the shoulder. Additionally, each cartridge slot has a smaller hole in the bottom to allow debris to exist. These $60.00 boxes feature a quality stainless steel hinge with small but strong magnets that provide secure closure. While these were originally crafted for PPC cases, Joe offers various hole diameters for different-sized small cartridges. For those who want more capacity (for longer strings of fire), Joe offers 40-round cartridge boxes. 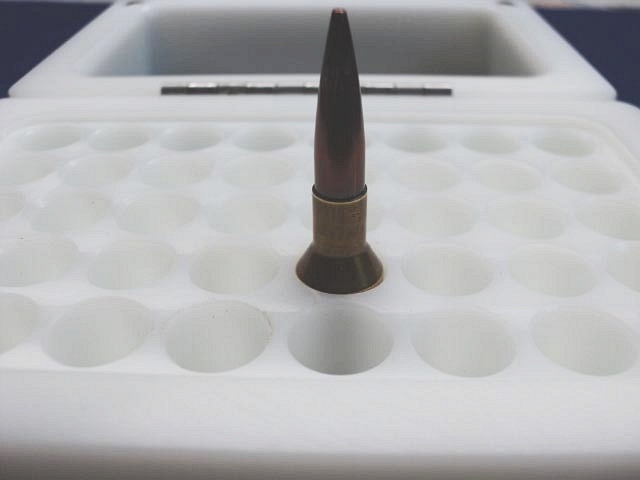 These allow shooters to change loads on the line, or simply have more rounds in a single box. With finger grooves front and back, the 40-rd boxes work for both left and right handers. Just like the 25-rd boxes, the 40s have a stainless hinge and magnetic closure. Price is $130.00. Joe’s Large Cartridge Boxes are taller to accommodate the bigger cartridges used for long-range shooting. 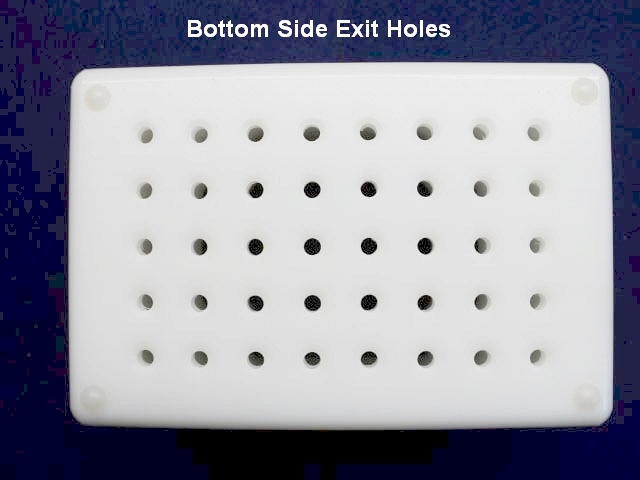 These feature magnetic latching and and bottom exit holes, just like the Joe’s original PPC boxes. Joe notes that, for some cartridges, the Large Boxes “have 20 holes instead of 25 because of the larger cartridge head size”. When ordering the Large Boxes, you need to specify cartridge dimensions and cartridge overall loaded length (COAL). Price is $65.00 per box. These cartridge “blocks” are made from the same material as Joe’s cartridge boxes. Each has finger grooves and exit holes. 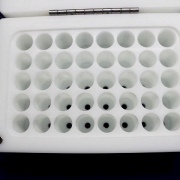 Joe says: “The size of the block is perfect for manipulating primed cases under a powder measure where space is a factor.” The 20-round block costs $19.00. Joe also offers a version with a recess on one side for empties. These have either 10 or 14 holes and cost $28.00. Share the post "Maisto Competition Cartridge Boxes — Quality Craftsmanship"
Christmas is coming up soon, so today we’re featuring a hand-picked collection of “stocking stuffers” for precision shooters. You can order most of these items online, and if you get your orders in soon, your selections should arrive before December 25th. So as not to bust your holiday budget, all of our selections are priced under $10.00. These items are handy tools that you’ll use over and over again at the range and/or at your loading bench (so you’re allowed to buy them for yourself, even after Christmas). Bifocal 3X/6X magnifier. This handy, inexpensive dual-power magnifier is always close at hand on our loading bench, because it helps with so many task. We use a compact magnifier to inspect bullet tips, to check brass chamfers, and inspect the internals of triggers and other parts. Priced at just $2.75, a magnifier like this (or the folding variety) is a “must-have” item for every hand-loader. Share the post "Eight Stocking Stuffers for Shooters, All Priced under $10.00"
Forum Member Tom Sziler(aka Tomekeuro85) produces very nice CNC-milled aluminum loading and sorting blocks that can be customized with your name or catridge designation. 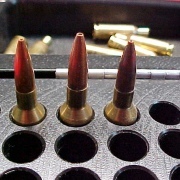 These start at just $15 for a 50-bullet sorting tray or 25-round range block. 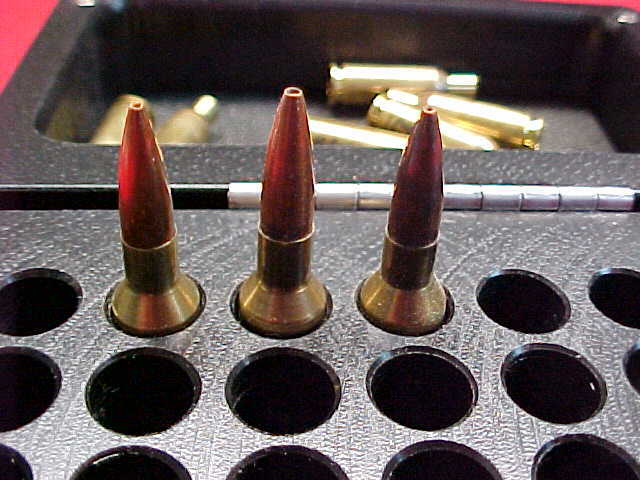 The original 50-round loading blocks cost $25 for most cartridges (smaller than .338 Lapua), $28 for .338 Lapua, and $30 for big stuff like the 50 BMG. 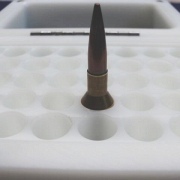 This bullet sorting tray is useful if you sort by base to ogive length or bullet weight. These blocks are definitely high-quality. Forum member PGG reports: “You can count on top notch work and materials guys. I bought a boat load of them for Christmas gifts [and] they were a huge hit. Super items, super service, great value.” Forum member WoolenMammoth agrees: “[I] ordered a few blocks recently and they far exceeded my expectation. Really nice work at an absurdly competitive price.” For more info, or to place an order, view this Shooters’ Forum Thread, or email Tom.Sziler[at]gmail.com. Share the post "Tom’s Customized CNC-Milled Loading and Sorting Blocks"